In 1960 Yves Saint Laurent caused a fashion stir when he took the popular street culture of beatnik and biker styles to the Parisian catwalks. His dramatic new styles included geometric print dresses influenced by Andy Warhol pop art. Mary Quant led the London fashion scene with her tunics and ever decreasing length mini dresses which replaced the wide skirts of the fifties. The curvaceous silhouette of the fifties gave birth to a new androgynous look promoted by super skinny models like Twiggy. Swinging London was being driven by the youth culture with ready to wear labels springing up everywhere names like Bazaar on the Kings Road, Biba on Abingdon Road, Lady Jane in Carnaby Street and Ossie Clark for Quorum. The Beatles were recreating their own fashion following in particular the bright red military jackets worn in the Sgt Peppers album cover became very desirable for trendy young men. The Kings Road was the haunt of groups of sartorial aware young people calling themselves Mods who rode scooters and wore parkas and neat Italian style clothing. 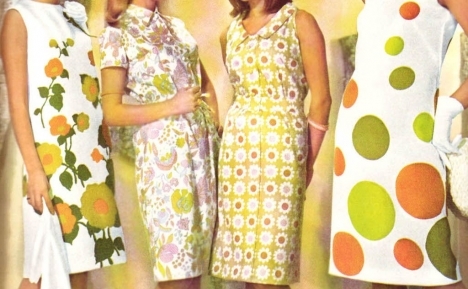 Designers were utilising the new materials of the period incorporating the use of PVC in black and white for baker boy style caps, double breasted macs, tunics and mini skirts. All in one nylon tights provide freedom for women. Huge bug eyed sunglasses in shiny black or white were the hot accessory. By the mid sixties hats were expected to be worn only for formal occasions such as weddings and at the races they were therefore used to make fashion statement. Hats generally had short, down turned brims and an elongated crown like a beehive hairstyle; berets, caps, rain hats and headscarves could be popped over short hair. Headscarves, hoods and bonnets were also popular.